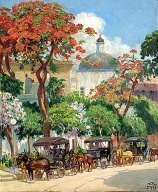 In the early 1900’s Ponce was branded as La Ciudad de los Coches (Spanish for City of the horse drawn carriages) as its citizens sensibly kept their traditional mean of transportation for many years after the introduction of the automobile into the island. Juan Nepomuceno de Castro along with its friendly horse “Churbi” was the first coachman-for-hire service that started in June 24, 1854. Later on, the most famous of all, Carlos Garay Villamil, carried on the tradition with a handsome calash inherited from his father. For decades, the dependable Garay stationed its carriage in the main town square (Plaza de Las Delicias) leisurely taking many tourists on a nostalgic journey, back through Ponce’s rich colonial history. In 1983, a plaque honoring his memory was fittingly placed at the Ponce City Hall’s front wall facade. In the 1960's the custom was kept alive with the contribution of the now defunct Banco Crédito y Ahorro Ponceño who brought and donated three carriages made at San Pedro de Macorís in the neighboring Dominican Republic. These were also utilized at the San Juan (Puerto Rico's capital) carnival parade. Nowadays, young and passionate Angel Manuel Serna has admiringly assumed the Ponce coachman duty under the various generations of calesh owners (Sammy Vélez, Nydia Nuñez, Rafael Vega and currently Luis Acevedo and Dania Díaz) that have undertaken the preservation of such an important part of our folklore. Angel Manuel is Ponce Lions’ Luis Tite Arroyo’s nephew and thus a proud member of the extended Travel Ponce family. 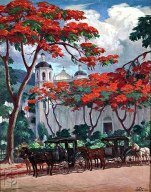 The famed Puerto Rican painter, Ponce born Miguel Pou y Becerra (1880-1968) in his drive to reflect the soul of his people and the characteristics of the local landscape, masterfully depicted this aspect of our rich traditions in two of its most popular oil masterworks: Los Coches de Ponce (1926) and Las Calesas de Ponce (1940). Guided, 25 minute tours through the historic town center: 787.502.8634 – THU thru SUN (11am-6pm) - USD$6PP.